One afternoon a few weeks ago at Dacres Wood, as I wandered up the steps from the pond to the meadow, my ears picked out a sweet sound amongst the birds, the blowing of the trees and the giggling of children. As I climbed the steps and turned the corner towards our ‘climbing tree’, the sound grew nearer. This was the tuneful strumming of a ukulele and the rhythmic rapping of a tune. Sat upon a log, bathing in the sunshine, T, L and E had formed a band called The Colourgrams and were practising their first song! I had about six years of music lessons when I was a kid. By the age of 16, every ounce of passion for music had been squeezed out of me: and I blame it on the lessons! 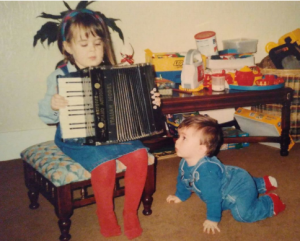 Once upon a time, I had been an inquisitive child of five who sat cross-legged and awe-inspired, looking up at my grandma playing old rag-tunes on her accordion. “Again, again”, I’d ask! She bought me a toy squeeze-box of my own and I was so proud. Sometimes she would practise with a band, and I would proudly bring my little accordion out too and pull the bellows as hard as I could to make my sound heard. But 10 years later, and a head crammed full of music theory, notations and scales, and I couldn’t stand it any longer. I closed my accordion away in its box and left it to gather dust. A few years later, wandering the streets of Hertford town near where I grew up, I met a busker playing in the street! He was playing simple, soulful folk tunes on his melodeon, and I became fascinated by the world of irish folk sessions and ceilidhs. Since then, I have learned to love playing music again; learning to really hear it and feel it… to move my fingers up and down the pearly keys, to push the melody through the bellows like a singer fills their lungs to fuel their melodies. It has taken so much time to regain some of that musical 5 year old child in me, but I’m getting there! 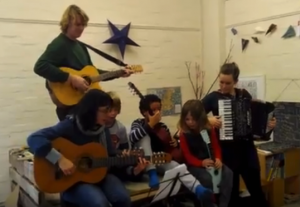 To watch how free and easy the children are with their music has been really inspiring for me. They are developing a confidence and presence on stage, learning to synchronize their playing to fit one anothers’ rhythms and styles, experiencing the tos and fros of teamwork, experimenting with instruments and sounds, and generally developing their musical ability. When I heard the children playing in the forest I was conscious not to interfere and ruin their fun, but really keen to see what happened next. I pulled out some shakers, an old drum, and a penny whistle from the garage. I left them out on the table and kept my distance. Recently, I read an article written by an unschooling* mum about ‘strewing’, which is the act of: “deliberately and strategically leaving out items around the home for children in order to ‘spark an interest’ or encourage learning.” The article describes how learning doesn’t need to be ‘artificially created’ and that an authentic way of living together is to recommend things to children as you would to a friend. For example, you wouldn’t leave your guitar out on the coffee table when your friend comes round to visit, in the hope that they picked it up and started to learn. That would be strange. But if you knew that your friend liked the guitar, you might leave it out to show them, or you might buy them a music book that you think they’d love. You might offer to teach them some tunes, or give them some tips if they ask for help. These softer and more authentic ways of appreciating other people’s playing rather than placing unnecessary pressure seem natural, real and appropriate to our space. Our first Christmas Show at Dacres Wood was headlined by The Colourgrams band. This was followed by shadow puppet shows, a rubix cube demonstration, acrobatics and Christmas carols performed by A’s mum, L’s dad, Rowan and me! I really enjoyed watching the children perform their songs, as well as getting on stage myself too. The children’s band seems to have just as much to teach the adults as we do them. We can teach them how to read music, to blow through a trumpet to make a nice sound, to tune a guitar, to form a chord – the technical things. In return, they can teach us to be loose and confident, to experiment and to play freely and creatively. This is a skills swap; a rich learning environment for everyone, not just the kids. The next day, A’s mum came to spend the morning with us, playing her guitar and singing carols from the show the day before. She didn’t force this, she merely sat in the corner of the room and started to strum the chords gently to herself. One by one, Rowan and I and nearly all the children came to sit around her, picking up ukulele, xylophone, shakers and another guitar. We must have sung Feliz Navidad more than 20 times that day as the children instigated it again and again… the sound of our music strewn all over the place. 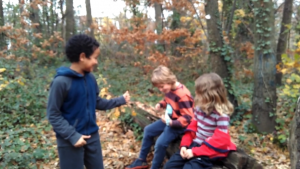 *At Dacres Wood I feel we have much in common with the unschooling movement, and I really like the parallels with our project that include: respecting children’s innate curiosity about the world and enabling children to freely explore their own ways of learning to learn.